History Eraser is a free and easy to use application for Chrome and Opera browsers. It allows you to easily delete your browsing history and prevent others to access and know what websites you've visted before. History Eraser is designed to use for both beginners and experienced computer professionals. You will enjoy the available private data protection features and very simple and neat interface. History Eraser can work on all desktop platforms: Windows, Mac, Linux and Chrome OS and is one of the best cleaning tools available for a Chromebook PC. Pre-configured cleaning modes: Easy, Medium, Hard and an additional Dev mode for the developers and professionals. This lets you quickly and accurately tune up for even more performance. Instant cleaning. 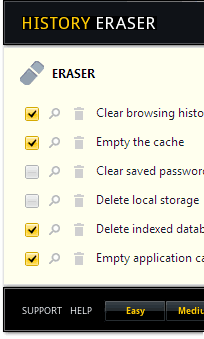 You can launch History Eraser with just 1-click on "Eraser" button and quickly delete all your private data or just a portion, collected during a specific period of time. Smart notifications. If you forget to remove your private data on time, History Eraser can notify you when it's time to perform a cleaning up. View, edit and backup your browsing history. History Eraser includes a History Explorer that helps you explore, backup or delete your browsing history in a more convenient way. Also, you can get more detailed info about web sites you've visited. Context menu integration gives you an quick and easy access to the advanced features like "Forget this page" - removes a data stored on your computer by a website and closes a tab, "Securely search for Google" - performs a search for a selected text using a secure https connection, "Open any links anonimously" - removes referrer information. All options can be easily configured using simple selections. The following options are available: Clear browsing history - Clear download history - Empty the cache - Delete cookies - Clear saved passwords - Clear saved form data - Delete local storage - Delete WebSQL databases - Delete indexed databases - Delete file systems - Empty application cache - Delete plugin data. Advanced Extra Features: Close browser after cleaning - Close all tabs before cleaning - Reload all active tabs after cleaning - Play sound when task finished - Prevent access to the default history page - Add Eraser commands to context menu - Remove items from your Google Web History - Stop syncing and clear all synced browser data - Enable secure search over SSL - Turn on notifications. History Eraser available in two flavours. You may choose to install the extension or the app. You can also use both together. Also, History Eraser for Chrome is compatible with other Chromium based browsers like SRWare Iron, Comodo Dragon, Torch, etc. You can download and install History Eraser from Chrome Web Store or Opera Add-ons Gallery. It's Free, Fast and Secure! To do this, just click on "Add to Chrome" button below, this opens the download page for History Eraser on Chrome Web Store or Opera Add-ons Gallery. Then click on "Free +" or "Download" at the right hand corner to start downloading and installing. Once History Eraser is added to your Chrome or Opera, you can start using it right away, you do not need to restart your PC or relaunch your browser. If you have any suggestions, questions or comments about History Eraser please use our support form. The number one security and privacy tool for Chrome web browser. The fast & easy way to delete private data in Firefox.